Long Keseh (Malaysia) (AFP) – With a grimace on his sun-bronzed face, Borneo tribal chieftain Lenjau Tusau glares down a dirt road that vanishes into a rainforest mist, on alert for what he views as a mortal enemy. Evoking their past as feared headhunters, Malaysian indigenous men and women in traditional longboats knifed down the Baram river in Sarawak state on October 23 to chase off surveyors and road-builders at the site of a proposed dam. They now man two blockades on roads into the remote region, the latest front in a battle against a colossal plan to convert Malaysia’s largest, wildest state into an industrial powerhouse. “We will not leave. Our life is here, our culture. The land, rivers, and rocks belong to us,” said Lenjau, 70, whose ear lobes droop from tribal piercing. Occupying northern Borneo island, much of Sarawak is a jungled landscape crossed by untamed rivers. State authorities are pushing plans to build as many as a dozen hydroelectric dams — Sarawak already has three — hoping that cheap electricity will lure foreign industrial investment to the underdeveloped state. Billions of dollars in such investment have been committed, the authorities say. “The state has not only the right, but the duty to develop the state’s resources for the benefit of present and future generations,” state-linked Sarawak Energy, which is spearheading the dam campaign, said in a statement to AFP. But environmentalists believe the project threatens one of the world’s last great rainforests at the heart of Borneo, an island shared by Muslim-majority Malaysia, Brunei and Indonesia. To members of Sarawak’s mostly Christian tribes, their culture is in peril. “We don’t want the dam and will do whatever we have to do. If they bring a dam, I bring a spear,” said Daniel Jalong Manok, 49, one of dozens of Kenyah, Kayan and Penan people manning the Baram blockades. Scores of Penan, upset with relocation terms, have blocked access to the newly completed Murum Dam 120 kilometres (74 miles) away since authorities began filling it in late September. Eight were briefly arrested in early November and dozens remain defiantly in their homes, despite rising waters. Tribes who depend on jungles and rivers for survival say Sarawak’s once-rich rainforests are already rapidly disappearing due to decades of state-backed logging and expanding plantations. Data published in the US journal Science this month showed Malaysia lost 14.4 percent of its forests from 2000-2012, the world’s highest rate. In the 1980s, the nomadic Penan were swept aside when they tried to block timber companies by seizing roads into interior regions. But Baram residents say a new resolve has developed as a budding native activist movement has grown, spreading the anti-dam message through visits to remote areas and word of mouth. Some key activists are also using social media to project their concerns abroad. “We trusted the government,” Lenjau said in Kenyah through an interpreter. At a road blockade on a stunning ridge-top, Baram protesters rail against authorities between joyous bursts of native song and dance. Their ultimate target is Sarawak’s all-powerful chief minister for the last 32 years, Taib Mahmud. Opponents accuse Taib, 77, and his family of illegally running indigenous people off ancestral lands and plundering Sarawak’s rich resources, charges he denies. Swiss environmental and human rights group the Bruno Manser Fund (BMF) last year estimated his wealth at $15 billion, citing financial records, which would make him Malaysia’s richest person. Sarawak’s first mega-dam — the 2,400-megawatt Bakun facility, one of the world’s largest — went online in 2011 after decades of delays plagued by corruption and mismanagement. Locals say it has destroyed the Balui River ecosystem, and many relocated villages accuse authorities of shabby treatment. A joint statement by 80 leading Malaysian NGOs this month accused Taib of “cultural genocide” and “systematic and disastrous environmental destruction”. Bakun’s capacity alone dwarfs Sarawak’s current 1,000-megawatt consumption, but Sarawak Energy insists all Bakun and Murum output has been sold to prospective industrial investors. Suggestions of massive oversupply are “ignorant or malicious”, it added. Taib’s office did not respond to a request for comment. 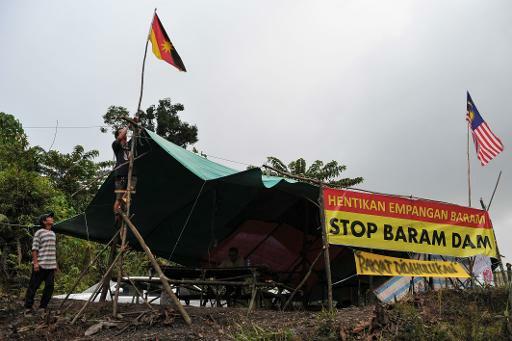 Indigenous activists say the Baram dam would flood an area half the size of Singapore and displace 20,000 people including villages like Tanjung Tepalit. The Kenyah community is set in a verdant Baram valley several hours upstream from the blockades. Dominated by a huge longhouse the size of a city block, it has a Catholic church, volleyball court and landscaped walkways. Residents fish and hunt game and tend paddy fields, oil palm, and other small-scale agriculture in surrounding forests. But village chief James Nyurang Usang, 63, said logging has severely depleted the forest’s bounty. The Baram, clear in his youth, runs brown due to logging-related erosion and fish are scarce. Many villagers make ends meet by working for timber companies or in cities. Nyurang, who travelled to Murum and Bakun to view conditions there, said many felt tricked and promised jobs at Bakun did not materialise. “If we have to move, it will be the end of us,” said Nyurang, whose longhouse quarters feature the mounted skin of a clouded leopard, wooden Kenyah war shields and a wide-screen TV. Sarawak Energy insists no decision has been made on whether to build the Baram dam. But activists say the company — whose chairman is Taib’s cousin — has a history of misleading communities and shutting out dissenting voices, which Sarawak Energy fiercely denies. Instead of dams, Nyurang wants government investment. His village has no electricity, school, or road access besides the logging roads along which huge trucks laden with giant trees thunder toward the coast. Neither Sarawak Energy nor the government have indicated their next steps. “Whatever millions they give, I don’t want it. Money vanishes, land does not,” said Jalong.